This week’s post is something new. It’s not a chronicle of this week’s crockpot magic, but instead its a 2 part salute to another amazing piece of cookery: the muffin tin. Do you catch the part about this being a 2 parter? Get ready. I feel like the muffin tin is underutilized in general…the name alone sort of hinders it from really reaching its true potential in my opinion. They can do so much more than muffins. As you are about to find out! They are also excellent at making cupcakes! Now, I understand that this isn’t much of a stretch from the norm (you’ll get more of that from part 2) but for most people its a major use for this item. Cupcakes are the best. You can be as creative or conventional as you want, and whose day isn’t a little better after eating one? As it happens, my friend had a birthday today (Happy Birthday Schmidt!). What better way to celebrate than to make some super fun cupcakes. FYI the main point of this adventure in cupcakery isn’t the recipe (I totally used a box) but the execution. Now, if you’re going “box” cupcakes you can do no better than funfetti. 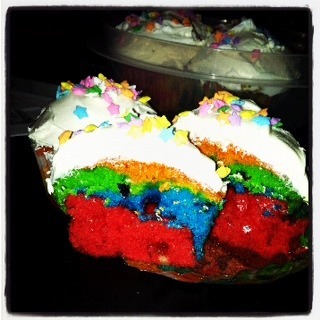 The recipe allows you to take funfetti to a whole new level by making them….wait for it….TIE DYE. Here’s how to make some cool tie dye cupcakes of your own. First you want to prepare the cupcakes per box instructions. Then you want to portion out the batter into individual bowls (the number of bowls is equal to however many colors you want). 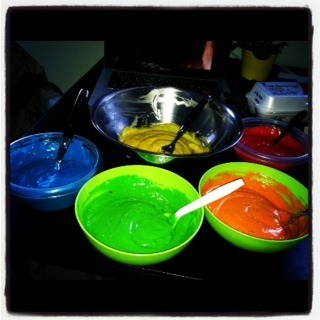 Then you want to add food coloring to each batter bowl and mix until you get the color you want. Then you want to spoon different colors into the cupcake liners. You can pick and choose which colors you want per cupcake. Just glob it in there and the messier/more carefree you are the cooler your tie dye will come out. No need to swirl them. See how cool they look when they’re done! Its really cool when you take a bite and see all the different color combos. They are a tasty and fun way to enjoy a favorite treat. I guarantee everyone will love them! 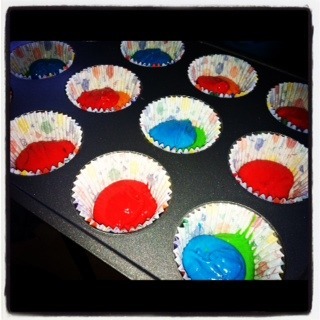 So Part 1 of my salute to the muffin tin covered how to use your tin to make cool tie dye cupcakes. And I admit that while those cupcakes were totally awesome, using a muffin tin to make cupcakes is hardly a revolutionary idea. That’s why I posting this guy. Part 2 will provide you with other, less conventional, ways in which to enjoy your cook wear. The great thing about the muffin tin is that can divide your food into appropriate serving sizes. If you’re like me and pack lunch and whatnot, this is a VERY convenient feature. 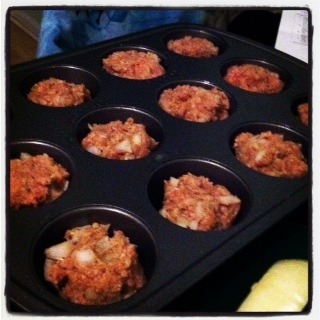 The other night I used my tin to make Turkey Meatloaf Muffins. In other words, individual servings of of tasty turkey meatloaf. Before I tell you how you can make your own I’m going to give you some other treats to make in your muffin tins—individual quiches, beef meatloaf, mini pies, and so much more than muffins. In a bowl you want to combine all the ingredients together and form into balls. Spray the muffin tin with non-stick spray. Put the balls into the tin and bake at about 350 for around 20-25 mins. I’ll include the side I made with my turkey treats because they were so delicious. I made some baked zucchini fries (A healthy alternative to potato fries). In a bowl you want to whip the egg a bit with a fork. In another bowl you want to mix up the breadcrumbs and cheese (with any spices you want). You want to peel the zucchini a little because the coating sticks better to the porous parts. Then slice them into thick fries. 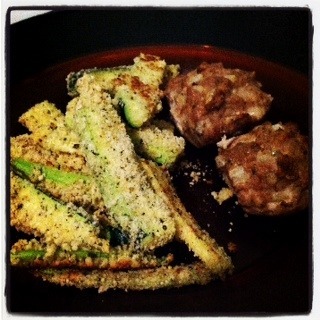 Dip the zucchini in the egg and then coat it in the crumb mixture and put onto a cookie sheet. Repeat until all your zucchini is done. Bake at 350 for about 15-20 mins. NOTE: Zucchini holds a lot of water so you don’t want to make these ahead of time because they’ll get limp. Overall this winter has been CRAZY warm. It was real easy to forget that based on the cold temperatures this past weekend though. 20 degree days…gross. The cold weather made me crave something weather appropriate. 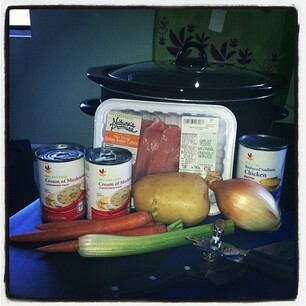 Nothing suits cold weather like a solid soup…or stew…I don’t discriminate. The thing is I am by no means a soup/stew enthusiast. I don’t dislike them, I just don’t prefer them. But hey, when its cold outside you do what’cha gotta do. So I flipped through my cookbooks until I found something that intrigued me. I settled on Turkey Chowder. Did you even know that there was such a thing? I sure didn’t…but again, I’m no soup expert. I figured it was a solid choice to warm me up, feed me for the week, and not bust my budget. Plus, turkey is one of my favorite things and I like chowder, so it stands to reason that I would enjoy them together. This is a pretty low maintenance recipe (are you noticing a trend here?) and only takes about 15 minutes of prep time…less if you have good knife skills. You just throw it all in the crockpot and turn it on. Cook for like 4-6 on high or 8-10 on low. 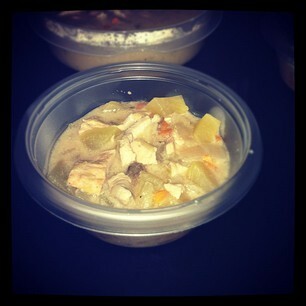 The result is 8 1 cup servings of a tasty and hearty soup!